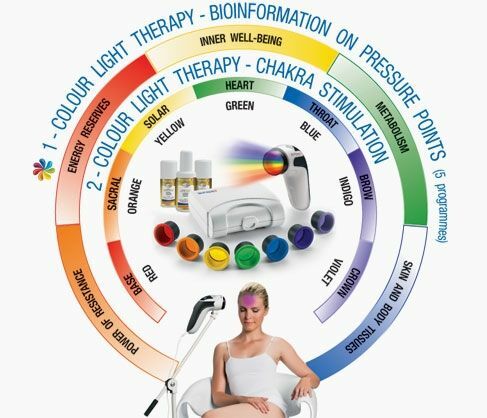 ​Millions of people from all over the world turn to Bioptron for a non-invasive cosmetic light therapy procedure to enjoy a more youthful appearance. 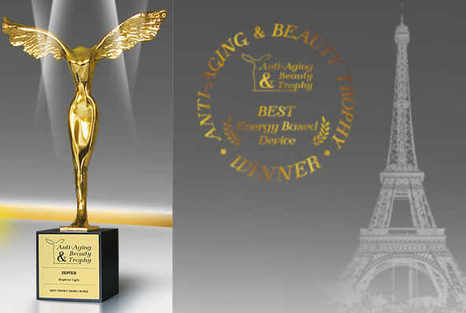 Swiss-made BIOPTRON has been voted the number one Anti-aging product at the Aesthetic and Anti-Aging Medicine European Congress in Paris. 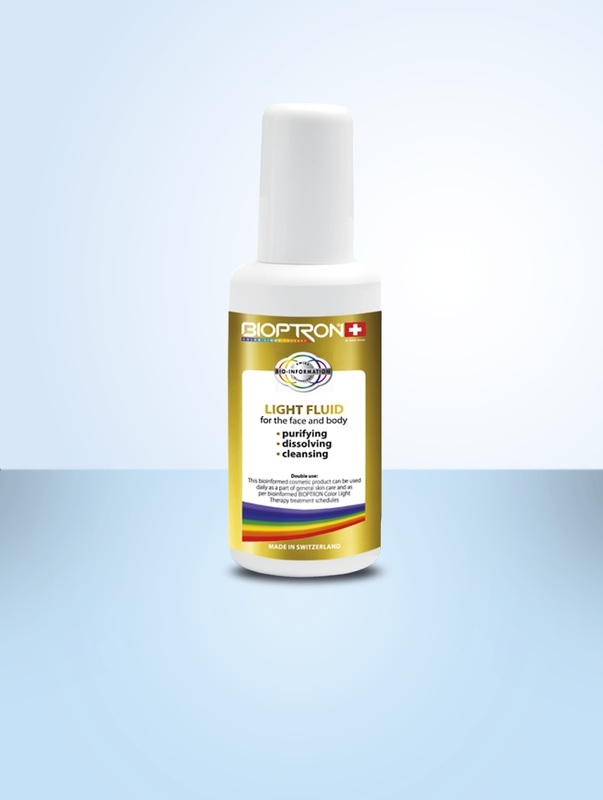 Several international medical experts have presented the effects of BIOPTRON light therapy at Anti-Aging Conferences in London, Paris, Monte-Carlo, Warsaw, and Bucharest show that BIOPTRON's penetrating polarized light is clinically proven to reduce fine lines, wrinkles, loss of firmness, elasticity, and uneven color of the skin - resulting in a healthy, youthful skin. 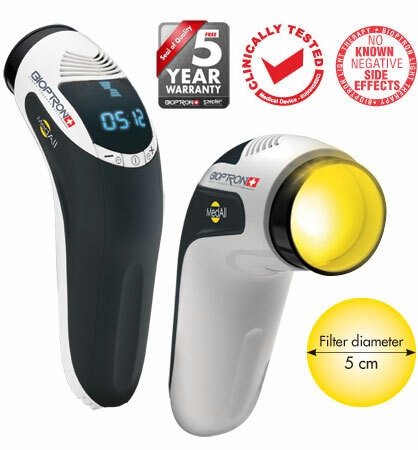 The 171 blue laser LED diodes operate at 470 nanometers and cure all inflammatory conditions, and the 36 infrared diodes cure all pain conditions at 940 nanometers. - It's the perfect solution for people who understand the necessity of constant care for a healthy looking skin. The innovation consists in the unique combination of wavelengths, their frequency, and scientifically grounded cosmetic procedures. - The Bluedoc is an aesthetically executed product intended to improve the quality of life. It is so easy to use that you are going to want to keep using it all the time. 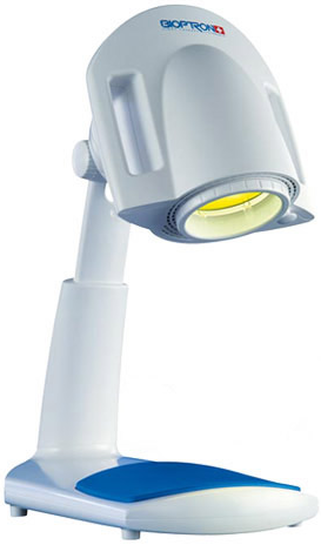 Medolight BluDoc can be used for a vast range of skin conditions like: preparing the skin for a cosmetological (cosmetic) procedure, coarse, itchy skin, consequences of injury to soft tissues of the face, aging skin, after a deep cleansing of the face, symptoms of acne, hyperesthesia. ​When mitochondria inside the cell are stimulated with Bludoc, they are stimulated to absorb more oxygen and glucose, which helps the cell to rebuild itself. This provides an anti-aging and anti-stress effect, as well as an increased metabolism. For the medical treatment, rehabilitation and prevention. 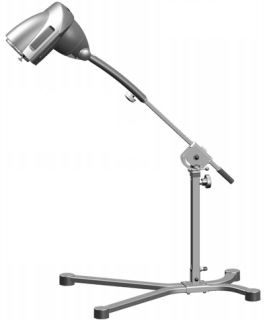 Bioptron MeDALL PAG-960 is the new generation of Bioptron lamps. 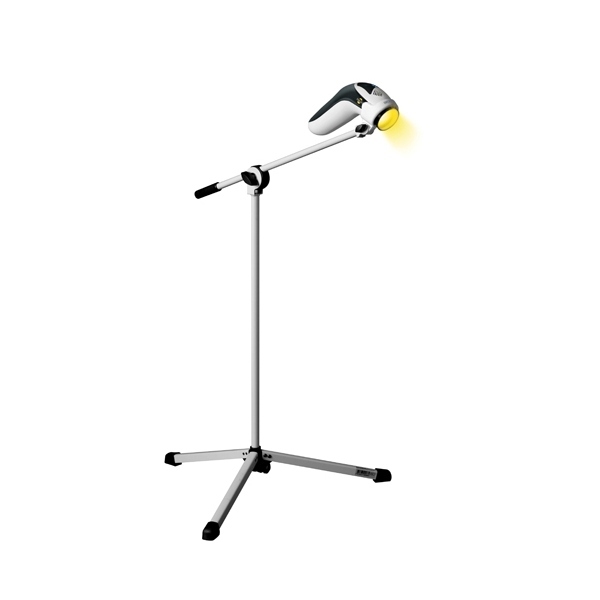 Its compact size and wide range of applications makes it comfortable to use in light-therapy. This makes MeDALL popular in rehabilitation centers and clinics. Its is easy to operate which also makes it perfect for home use. Bioptron MeDALL PAG 960 is equipped with a display with easy control panel, which makes the unit easy and convenient to use. 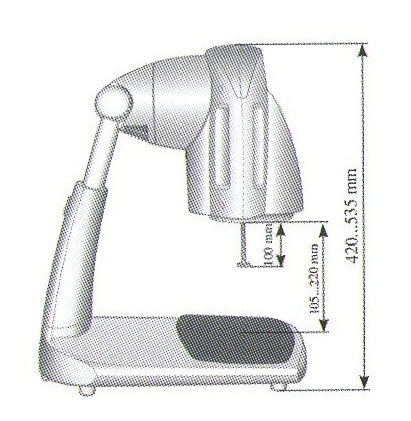 MeDALL is in general designed in a manner as to provide the greatest convenience. 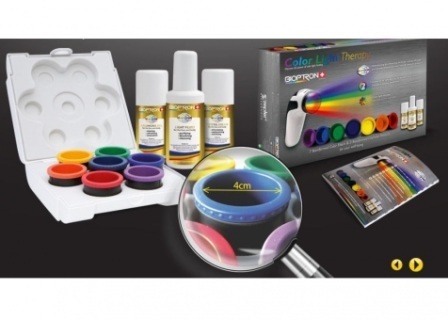 Comes in a handy container, so it can be stored safely in the home and easy to transport. 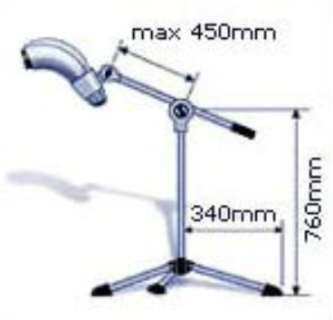 MeDALL covers an area of ​​up to 40.72 cm2 and thus provides a big treatment area. 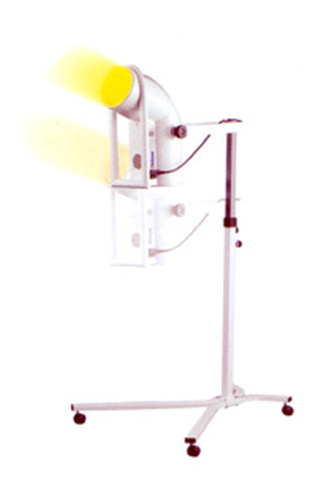 The lamp diameter is 5 cm. Bioptron MeDALL PAG-960 is excellent for the treatment of wounds and injuries - It strengthens the body's natural healing process! Furthermore, the excellent for pain relief, treatment of dermatological diseases and skin disorders, the treatment of winter and other seasonal depression. Bioptron MeDALL PAG-960 has also been used to treat childhood diseases! Consumer safety with “snap-in” security system which provides further safety. Mobility enabling full-body treatment. High level of comfort for pleasurable treatment. Can be stored under beds and tables. The design makes it usable in all kinds of rooms.Consumer friendly installation and adjustment. Mobility which enables a BIOPTRON light therapy treatment of the entire body. High comfort for a pleasant treatment . Can fit under beds, chairs and / or tables , etc. The design practical for use in all types of rooms . User-friendly installation and adjustment . These professionally handmade bioinformed colour glass filters are incredibly effective in chakra healing. They are developed at the Institute for Bioinformation in Zurich and produced in France. The glass filters contain information patterns which are taken from plants, precious stones , metals, minerals, trace elements, inert gases, fermented substances, etc. This means that it is easier for the body to absorb both the BIOPTRON light as well as the seven vitalizing chakra colours. Consumer safety - with ' snap -in' safety system that increases safety further . Hjulene til stativet skal købes separat. Se nedenfor. 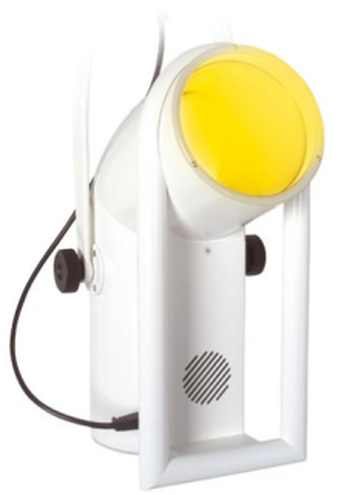 This light therapy lamp is designed for use at home, in hospitals and therapeutic centers primarily for color therapy . 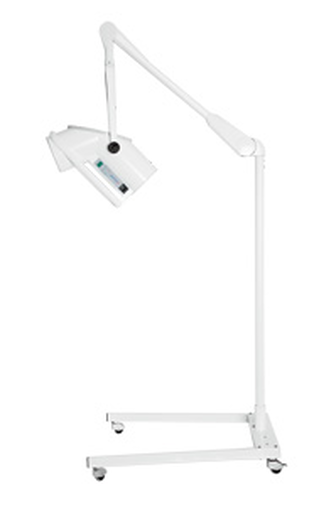 This purchase included an ergonomic table-stand allowing flexible use at home as well as at the clinic. The stand's height and lamp head inclination is easily adjustable and the lamp head can be rotated 360 degrees. This means that it can practically assume all possible positions. Treatments can easily be timed to min. 30 seconds by means of a control panel. A built-in distance sensor ensures that the recommended distance to the skin surface are observed. The table-stand is equipped with a dust cover and a comfortable supportive mat which is easy to disinfect, wash and change. Light diameter is about 11 cm . After hand made production og the glass filters they are enriched with BIOPTRON color glass filters containing bioindformation . Using biophysical methods and devices, the Institute for Bioinformation in Zurich have developed highly structured regenerative information patterns. These patterns are derived from plants, precious stones, metals, minerals, trace elements as well as inert gases, fermenting substances, etc. The glass filters are 100 % handmade and of the highest professional quality. 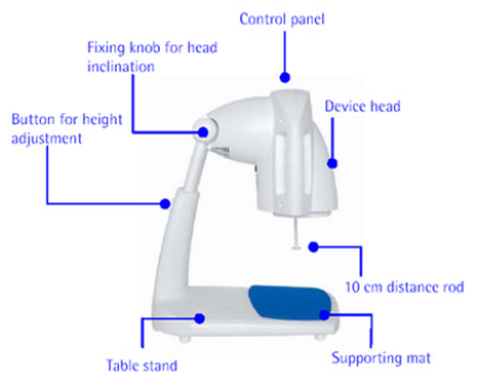 A medical device designed for professional use in the health sectors. 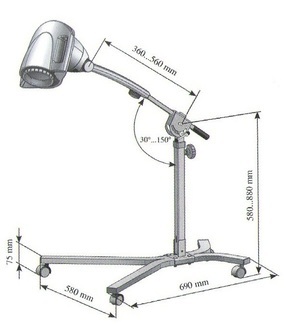 It is used in hospitals worldwide and is of the highest quality of craftsmanship. In addition to professional use it can with out risk risk be use at home. Treatment sessions can easily be pre-set for up to 95 minutes, which can be divided into smaller sessions as required. This is controlled manually by using the machine's electronic "start" - and "stop " button bifocals . The lamps angled design makes it easy to locate the appliance in many different positions , which facilitates a deep treatment of the entire body. BIOPTRON 2's filters diameter is around. 15 cm. 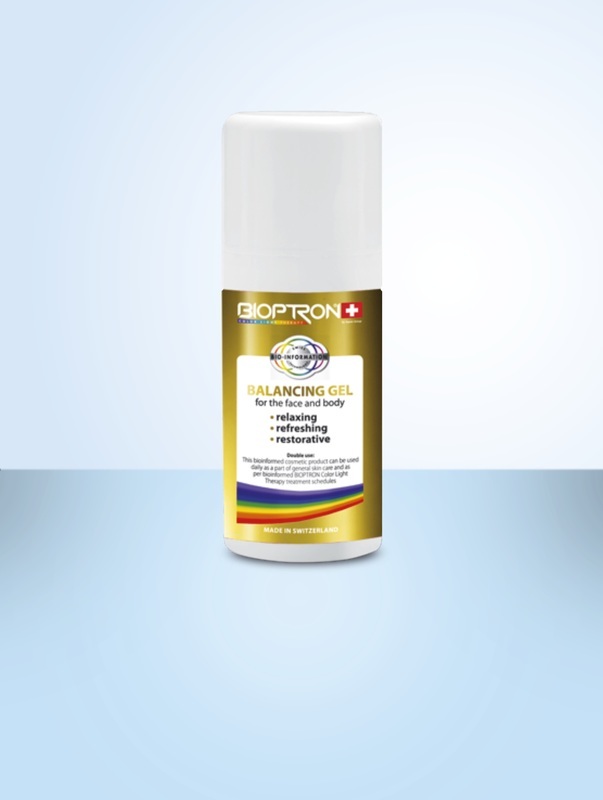 This gel acts in an extremely relaxing, refreshing , revitalizing and nourishing way. OXY STERILE SPRAY - 250 ML. The Swiss-­made Oxy Sterile Spray is pure water enriched with a concentration of oxygen for moisturizing, vitalizing, relieving, healing and protecting both the face and body. Use Oxy before a BIOPTRON Light Treatment on the area you want to concentrate on. 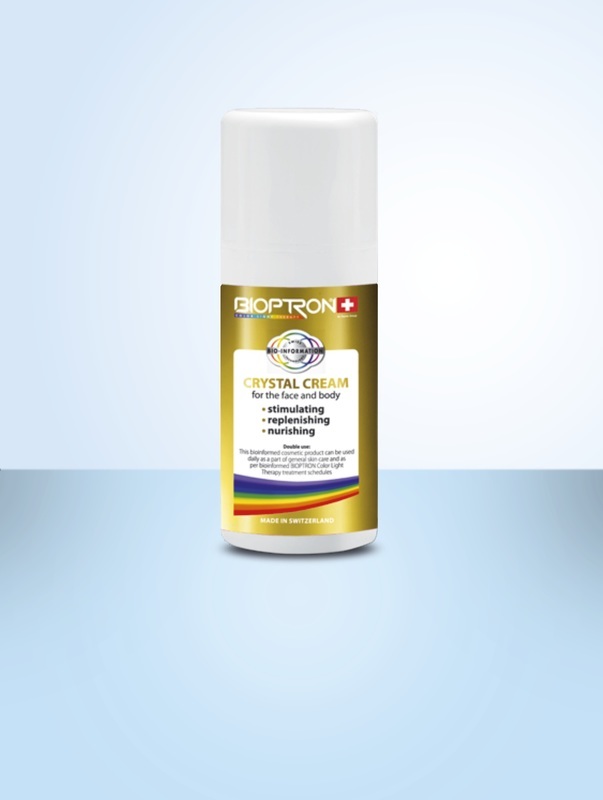 It is ideal in combination with BIOPTRON for Anti-­Aging treatments, certain injuries, and wound healing. Oxy Spray is STERILE -­ making it suitable for even the most delicate baby skin. Oxy Sterile Spray is pure water enriched with a high concentration of pure oxygen. The product is totally sterile. Oxy is made of fresh Swiss drinking water which has been purified into Medical Quality Grade Water, (USP). This pure water is treated in a patented Oxygen System to increase the concentration of soluble Oxygen in the Water. WHATEVER YOUR CONDITION, FRESHEN UP WITH OXY IN EVERY SEASON!